Mix the Bisquick, buttermilk and sugar together in a bowl. Turn out onto a well floured work surface. Knead 20 times (this is a very forgiving dough), and don't be afraid to get additional flour into the dough. Roll 1/2 thick, or thicker if you prefer towering biscuits. Cut out into 2" rounds (or your preferred size). Place close together on an ungreased baking sheet. Bake for 8 to 10 minutes; I usually find 8 minutes is enough. 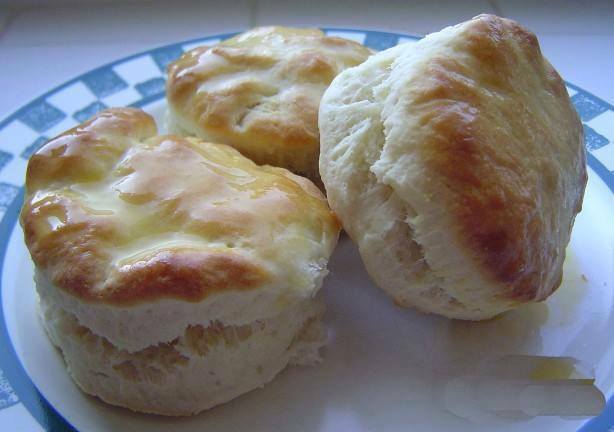 When you remove the biscuits from the oven, brush the tops with melted butter again.